THE MEDIA WILL “kill” Real Madrid if they fail to beat Liverpool in the Champions League final on Saturday, according to Marcelo. Madrid are looking to become the first side to win the title in its modern format for the third time in a row, having claimed a second successive crown in Cardiff last year. But they have endured a difficult campaign domestically in 2017-18, finishing 17 points adrift of champions Barcelona in La Liga and falling at the quarter-finals of the Copa del Rey. 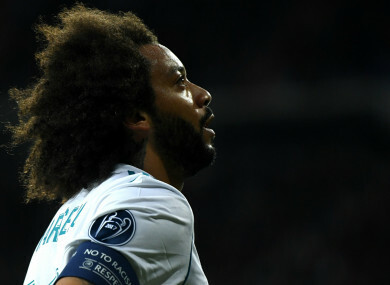 Madrid triumphed in the Club World Cup, the UEFA Super Cup and the Supercopa de Espana, but Marcelo believes the critics will be out in force if they do not deliver the goods in Kiev. “We’ll see what happens after the final. They’ll either kill us or praise us,” he said. “I don’t think this season can be considered a disaster. Team-mate Dani Carvajal conceded Madrid’s season has been far from perfect but urged against an overreaction to their shortcomings. “It’s been a unique season, with ups and downs, but we’re in the final of the Champions League,” he explained. “All teams would love to be in Kiev, the Champions League is the most valuable trophy of them all. Email “'They'll either kill us or praise us' – Marcelo ready for backlash if Madrid lose Champions League final”. Feedback on “'They'll either kill us or praise us' – Marcelo ready for backlash if Madrid lose Champions League final”.